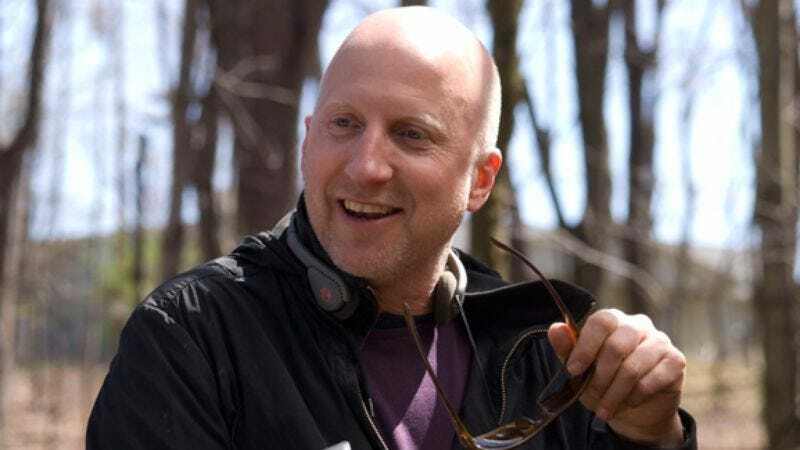 Australian-born director John Hillcoat had already directed two films—1988’s Ghosts… Of The Civil Dead and 1996’s To Have And To Hold—by the time he came to America’s attention. But by that point, he was better known as a music-video director, after collaborations with Depeche Mode, Suede, Atari Teenage Riot, Manic Street Preachers, Therapy?, Bush, Einstürzende Neubauten, and Nick Cave & The Bad Seeds, among others. His work with Nick Cave has been particularly fruitful: Cave co-scripted Ghosts… Of The Civil Dead and wrote Hillcoat’s breakthrough film, 2005’s Australian period Western The Proposition. He’s also soundtracked all Hillcoat’s features, including the new film The Road, an adaptation of Cormac McCarthy’s Pulitzer-winning bestseller about a man (Viggo Mortensen) and his son (Kodi Smit-McPhee) on a desperate cross-country journey after an unspecified apocalypse reduces America to ashy ruins populated by starving, crazed cannibals. The Road has had a bumpy path to theaters—originally scheduled for release in late 2008, it was rescheduled for this year, setting off an endless round of speculation about what had gone wrong with it. An initial studio trailer that made extensive use of news footage not from the film stoked speculation that Hillcoat had rewritten McCarthy’s spare, solemn story as a slick modern thriller; reports of an initial four-hour cut of the film similarly stirred up negative buzz. But now The Road is hitting theaters, and it turns out to be a deeply felt, gorgeously shot, surprisingly faithful adaptation of McCarthy’s book. Hillcoat recently spoke with The A.V. Club about his hopes that people will take the film on its own merits, and that it’ll become a huge crossover hit. The A.V. Club: What’s your version of what held the movie up for a year? Why all the delays in the release date? John Hillcoat: Well, multiple reasons. First, it’s that the release date was never realistic or vaguely achievable, was way overambitious. So that’s a great source of frustration for me, of course. Because I never said that would be possible. I mean, just to give you an example, we were filming into post-production—by the time the shoot ended in May, one of our key locations was still 20 feet under snow, so we had to go into post-production and then go back into production and shoot in Mt. St. Helens as late as July. So there was that, and getting the balance right between the apocalyptic events and the various encounters along the road, and the nuances of that story, always trying to protect that love story between the father and son. So we missed last year, and we had the choice of “Do we bring it out this year earlier, like in the summertime?” But that would be a big mistake, because now really is the perfect time. Thanksgiving—I can’t think of a better day in a year to release this sort of film, because it is all about giving thanks. But the short answer is that we wanted to get it right and finish it properly rather than to squander it. AVC: It feels like you’ve been fighting the media for a year now, over the release delay, the reports of a four-hour cut of the film, and the original action-style trailer. What’s your feeling right now about how the film is being perceived? JH: See, the problem with a book like this is, the expectation just builds and builds and builds, and then it becomes negative expectation. So it’s a non-win situation until you get it out. The four-hour cut… That was the very first assembly. And it is a long assembly, although the average is three to four hours on the rough cut of 90 percent of feature films. It was actually four and a half for us, because we filmed a lot of extra scenes. When you have a father-and-son journey where they’re in every single scene, to get that journey right and avoid obvious repetition is quite a juggling act. Certain scenes, certain material—one controversial thing was the baby scene from the book. Now, I said “Right, we’re going to make this true to the book. We’re not going to shy away from anything.” And that was a scene that I fought long and hard for having in the film. And then I fought for having it out of the film, because it was obvious—this is where film is such a different medium from a book—is that it was totally redundant by the time you got to it. Having gone through those other encounters, it was like reverting back to an early part of the story in their journey, at a point when the boy is actually encountering people and is taking over from his father. So it didn’t work in the film structure. It works in the novel, but when you see it, it’s just too literal. So there were all those things to discover in translating from book to film. Of course I wasn’t happy about the trailer. I understand the first one, but I think the second one is much better. The idea of putting in stock footage that you never shot is… I would never… or never wanted to include, but I also can understand from a marketing point of view the argument of people that have never read that book, that know nothing about this film, need to put it into some kind of context. And yet because in the film, you have the advantage of gradually drawing your own conclusions about what happens… but it was a misfire in the sense that one of the most original aspects of the book is the fact that you never explain or draw attention to the big event. AVC: Was there pressure at any point to make a film that was more like the one depicted in that first trailer? The kind of 2012 modern disaster thriller? JH: There was at some point, but it was very short-lived, because everyone involved realized this is primarily a love story between a father and a son, and without that emotional connection, there’s no reason to make the film. And the material wasn’t there to make that kind of 2012—that’s a different approach. And we never really—it’s not in the nature of the material. And there was an overall commitment to the book. That’s the thing we could always return to. So there were definitely discussions and debates, but it always came back to the book. That’s what everyone wanted to honor. I’m very pleased with the results. I didn’t want to focus on what happened with the book, because I was always just returning to my initial response when I first read it as an unpublished work. AVC: Even before the book was published, the film rights had been acquired and you were attached as director. Once it actually came out and became a Pulitzer winner and a bestseller and an Oprah book, how did your expectations for what the film would be change? JH: Well, none whatsoever, in the sense that I always tried to focus on—if you’re a horse in a race, if you don’t have those blinkers on, and you turn your head and look at the audience, you’re just going to trip up and fall. So I tried to never get intimidated by McCarthy’s legacy, and I tried to ignore—I have no control over any of that stuff. And it would just destroy me—not destroy me, but destroy the real task at hand, which was to… I had this incredible emotional response to the manuscript, and obviously I understood that that was translating, because what I got out of all that Oprah and Pulitzer Prize stuff is that that same freight train that hit me, that emotional freight train and that way that it’s hard to stop thinking about some of this stuff, that obviously translated. So that’s a big plus. And yet it’s huge pressure to try and make sure that comes across somehow. [Laughs.] I’m not denying the pressure was there—in fact, every event was just like “Oh great. There’s another weight on my shoulders.” I knew already, though, when I undertook this, that every rifle would be aimed at me. Because I already knew that Cormac was a great writer. Blood Meridian was the main influence on The Proposition. But I’ve always liked to take risks, in that I think that’s the only rewarding way of making films. I think when you play it safe, you get the most frustrating, disappointing results. AVC: With The Proposition, you set out to make a distinctly period, specifically Australian Western. Was there any kind of similar agenda with The Road? Does this story belong to any particular country or any particular time period? JH: Well, I do love genres, but I love finding new ways into the genre, or making that world fresh again. So when I couldn’t get [the film rights to] Blood Meridian, I started looking at a new way of telling a frontier story, and that’s what drew me to the Australian frontier. The Road is definitely set in America, but it’s also about corporate cannibalism. It translates to the rest of the world, you know? We’re in an age where corporations are in every country of the world, and these brands are everywhere, so it does have broader meaning, but it’s still specifically meant to be America in the post-apocalypse. I think it’s much more relevant, because I think we’re seeing the end of the American empire. The Proposition was the British Empire. Also, just on another level, the landscapes in both cases are major characters. It’s a three-hander in The Road—the father, son, and the world they’re in. With The Proposition, likewise. It’s this other world that the empire’s trying to map out and take control of. And it’s extreme worlds. The Proposition is extreme in that there’s too much sun and a barren desert, and The Road’s extreme in there’s no sun and it’s too cold and no food. Life as we know it is coming to an end. AVC: You’ve said in the past that that kind of extremity—extreme moral situations, extreme conflict, the extremity of the environment—is a draw for you in stories. Why? JH: Well, I think because it gets to who we really are. For me, all drama is based on conflict. So it’s a natural extension of that. And one thing I love about Cormac McCarthy is the types of pressure he puts onto people. You see the best and the worst in people, you really see what humanity is made of, and I think that resonates in some way. Or I hope it does. They’re stories where from our own comfort zone, we can all pontificate about what sort of people we are, and what we’d do. But it’s only until the real pressure is on in our own lives. I think this is true of everyone, that we’re often surprised how we act under pressure, and it brings out aspects of who we really are. As Cormac said with The Road, for him, it’s a story about human goodness. And it’s a love story that’s unlike many love stories, and very fresh and original in that way. AVC: If you could get the rights to Blood Meridian now, would you still be interested in adapting it? JH: Well I certainly think that there’s something about the American frontier where there’s—I mean absolutely. I think it’s a tricky one, it really is. In this climate of the industry right now, I think it would be pretty well impossible to make that film. If I had The Road land in my lap right now, even if it was already published, it won the Pulitzer Prize, and Oprah just did her interview with Cormac, this film could not be made now. AVC: What’s changed so radically over the last two years to make this an impossible film? JH: Well, I think this is actually what The Road is all about. Fear shuts off possibilities. The first thing that kicks in when you’re reacting with fear… This is what I love about Roosevelt’s quote, “There’s nothing to fear but fear itself.” What we’re doing now—and this has been going on for 10 years, virtually—a lot of things have come home to roost, and the problem with fear is that we become reactionary and we shut possibilities out, like the father does in The Road. And it takes the son to break through that and take a leap of faith. And the problem at the moment, just in the film-business side of things, there’s a major shake-up that happened to the record industry. And the new technology, it’s the biggest change in the film industry since it began, without any question. And that’s filtered through all over the place. There’s major changes happening with technology and economics. But unfortunately, the initial reaction on any new frontier, it gets bloody, and people are overreacting, and very defensive, and they’re not taking risks. In fact, they’re taking such safe measures that they’re shooting themselves in the foot. AVC: Both the film and the novel leave the nature of the cataclysm that destroys society as a big blank. Given what you’re saying about the economic meltdown and corporate cannibalism and technologies, did you personally have something specific in mind as the cause of the apocalypse? JH: I certainly, definitely wanted to leave that open to interpretation, because I see that as a projection of your personal worst fears. Some people fear that it’ll be manmade, as in nuclear terrorism, for instance. Other people fear it will be the environment. People are out there saying that we are way overdue for a comet. Do you see what I mean? So I wanted to keep that all still alive. And yet personally, in my own point of view, I think the largest greatest threat right now, over and above anything by a mile, is the environment. But they all feed into each other, you know? The problem with an economic meltdown is that the responsibility and the challenges to deal with the environment are squandered. That’s an age-old battle in terms of the major conflicts in places like Afghanistan, etc. So there are age-old battles that’ll keep going on. Unfortunately, man is a very slow learner, and we tend to repeat mistakes, as opposed to learning from mistakes. However, there’s the higher aspects of mankind that this book is kind of clinging to. And our basic humanity, not getting intimidated and trying to see through the fear, is what’s crucial. AVC: This is pretty much the definition of a prestige picture. It’s strikingly beautiful, original, and emotional, but it isn’t exactly commercial. It’s an off-puttingly bleak film. JH: Well, that’s what people said when Cormac’s book came out, when people first read that manuscript. And yet it is the single most translated book in modern times. Which means it’s like a bestseller beyond bestsellers. So in that sense, it’s really struck a chord beyond just the highbrow aspect. And I’m just hoping the prestige part doesn’t get—I’m hoping it can cross over, is what I’m trying to say. Because I think that’s what the book did to its readers. That’s a ghetto, being considered a prestige picture and nothing else. But I’m optimistic, because it seems that the movie is striking a chord in people, so we’ll see what happens.